When I first started homeschooling, I didn’t know whether I was coming or going. It was like a whirlwind and I was just along for the ride. I was initially so excited about homeschooling my kids that I honestly didn’t plan like I should have or go in it with realistic expectations. Staying on track and keeping my children’s schedules in order was just not something that happened my first year. Here we are mid-year and I know I could have done better. If you are new to homeschooling, take heart. You are not alone, we have all been there. You can do this! You just might need a little help, and that is OK. I needed a lot of help and I am not ashamed to admit it. Organization and order bring me joy. When my house is clean, I can concentrate so much better. When my desk is in order, I can work so much more efficiently. I am not quite sure what happened when I started homeschooling. I really struggled with keeping the house clean, and cooking dinner, and working from home. Please tell me someone else out there understands. I have a paper planner that keeps my business life together. I order a new one every year and it has everything work related in it to keep my freelance work going smoothly. I am meticulous about my work and cannot afford to miss any appointments, being late or not completing tasks. I needed to be as organized with my homeschool as I was with work, and I was determined to do so. Staying on track and keeping my children’s schedules in order took me years to get right. I think it took so long because I didn’t have anything to motivate me to “get it together”. I let the days slip by my fingers, telling myself I will do better tomorrow–while dreading that failing feeling Ihad when I laid down to sleep. It felt like groundhogs day, stressful, hectic, and repeating itself daily. Something had to give. I heard of Homeschool Planet’s homeschool planner online and I knew I had to give it a try. I have never looked back since. 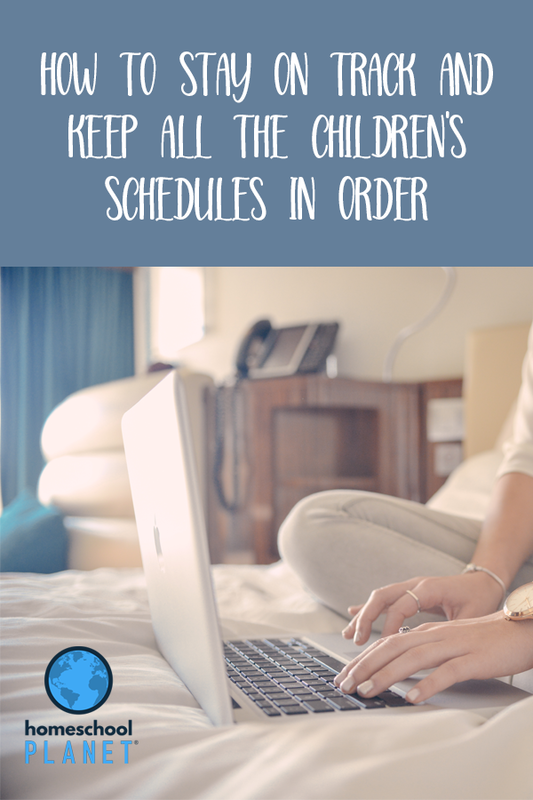 I want to share with you what in Homeschool Planet’s online planner keeps me on track and keeps my kiddos on their schedules. 1. Homeschool Planet allows for an easy whole year planning system from start to finish. I cannot describe the weight lifted off of my shoulders when I knew I could just plan out my children’s WHOLE homeschool year. Homeschool Planet’s user-friendly options to plan out the year make moms happy campers. I was able to break up each child’s calendar into terms, although you can also break them up into semesters or quarters. 2. I can use Homeschool Planet to communicate with my family when I just don’t have time to chat. This sounds horrible I know. However, texting my hubby to pick up dinner on his way home from Homeschool Planet’s site is incredible to me. It has saved me many of times from needing toilet tissue for the house or picking up the kids from a friends house—you name it. Assignment reminders for the kids can be sent via email or text, which really helps when they have their headphones on. I literally can send a text or email lists, notes, and messages right from within Homeschool Planet to family members. How cool is that? 3. Homeschool Planet has widgets for everything. Really, everything. We can complete our to-do lists in Homeschool Planet; in “we” I mean my husband and me. We are in the process of renovating a rental property. We don’t have a huge budget for it, so we track every cent we pay and we log in our next steps. It really helps keep us accountable to our goals. My kids love that they can use the Homeschool Planet widgets to look up reference tools like a dictionary/thesaurus or search Google right from the planner’s site. I love to check the weather while I am on and read the Bible verse/inspirational quote on the screen whenever I turn it on. The planner can track and report class hours with a convenient clock icon that lets you see exactly which items you are tracking. 4. Calendars and reports are everything I need to keep my family on track and to stick to our schedules. Each child is able to access their very own calendar and I can adjust it as needed. I clearly can see their calendars and what they have planned for the day. All of our appointments and game days are on the calendars. I truly love being able to see where our kids are at any given time and they like to keep tabs on me as well. The calendar system can hold my daily routines, chores, and activities while letting me view my kid’s as well. The online planner has extensive reports to help manage grades, attendance, activities, and more. The report is filterable to obtain the exact information we need. I let Homeschool Planet handle these administrative tasks for me and it is a blessing on my workload. Rescheduling assignments are super easy, and I appreciate that so much. I can have one on one with a child if they are struggling, then re-assign a task to them. It keeps me involved and proactive in their learning. 5. I saved the best for last. Homeschool Planets have an ever growing list of lesson plans for any student. The lesson plans are exclusively made for Homeschool Planet. There are over 750+ professionally designed lesson plans that we can select from. Each of the lessons is customizable to fit the schedules you have set out for each child. The lessons are printable and you can even print out free homeschooling worksheets for your kids to use offline. 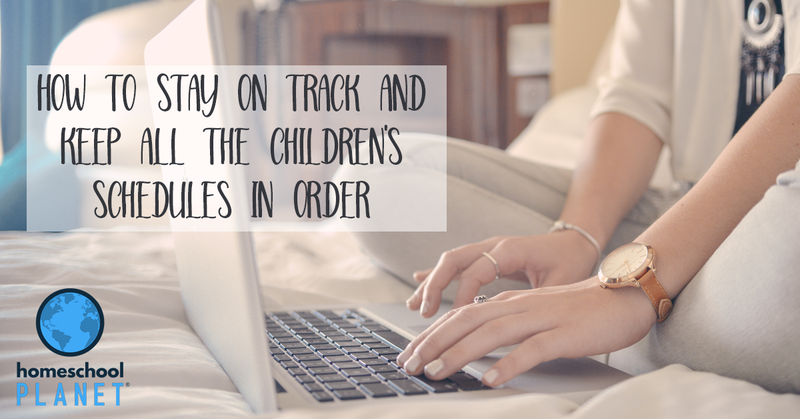 Staying on track is as easy as a click of a button with Homeschool Planet. I only wish I would have known about it my first year of homeschooling. Homeschool Planet keeps me on track at home and in my homeschool all one place, and it’s available 24/7/365 days a year. I already use it for school and for my home. I am seriously considering using Homeschool Planet’s planner online for my work as well. I will always be a pen and paper planner gal, but keeping organized and logging down my ideas, meetings, and deadlines sounds more and more appealing by the day.